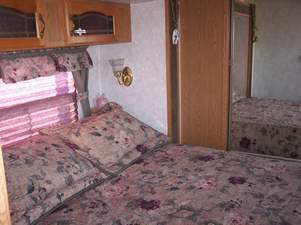 A 2004 Keystone Mountaineer Travel Trailer. It is located on a lot ( 75 X 150 } with electrical service, sewage hookup and a metal cover over the trailer as well as a parking area. The lot is has a couple of trees and several small shrugs. It is located in Seadrift, Texas ( 33 mies south of Victoria on Hwy 185, 19 miles south of Port Lavaca and 19 miles north of Port O'Connor ). A fantastic fishing area on the San Antonio Bay.